UPDATE: Suspended member of the mayoral committee (MMC) for health and social development Dr Mpho Phalatse apologised for controversial comments she made earlier this month in which she called Johannesburg â€œfriends of Israel”. â€œI would like to issue my most sincere apology to the residents of the City of Johannesburg for the confusion and hurt caused by my remarks,â€ she said in a statement. Phalatse said she now realises that the Middle-East conflict is a sensitive subject that should be approached with care. She also said her remarks were taken out of context because her speech touched on the local government’s commitment to freedom, fairness, opportunity and diversity. 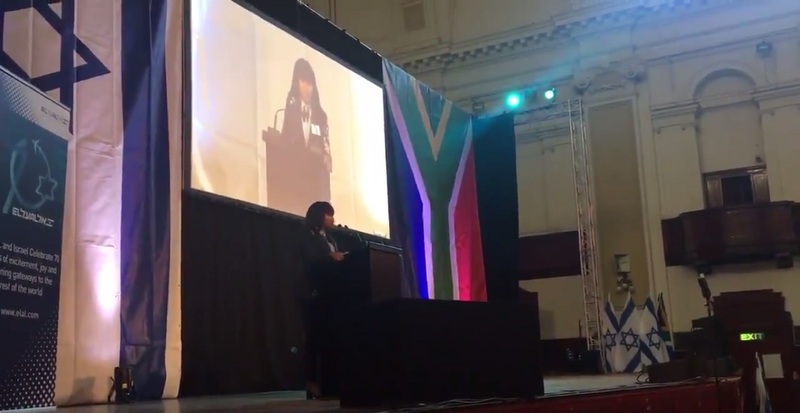 Mayor Herman Mashaba suspended Phalatse shortly after she made the remarks during a speech at the South African friends of Israel national conference. At the SA Friends of Israel National Conference 2018 earlier this month, Phalatse made a declaration that sent the political parties and anyone aware of the brutality of the state of Israel into a frenzy. Phalatse declared that she and the City of Johannesburg were the friends of Israel, ignoring years of South Africaâ€™s diplomatic policy, and apparently without mandate from the mayoral committee or the mayor. The short clip of her unmandated speech at the conference has resulted in her immediate suspension, the executive mayor Herman Mashaba announced today. â€œI have taken the decision, as the mayor of this city, to suspend MMC Phalatse pending further investigation into the full and proper context in which those remarks were made,â€ he said in a clip posted by Floyd Shivambu. In a press statement, the African National Congress (ANC) strongly condemned her actions and â€œunequivocallyâ€ distanced themselves from her utterances. â€œAs the ANC in Johannesburg, we re-iterate our solidarity with the heroic people of Palestine. We condemn Israelâ€™s occupation of Palestine and the systematic oppression meted out to the Palestinian people for decades,â€ the party said. The Economic Freedom Fighters (EFF) Johannesburg Region, which runs the City of Johannesburg in a coalition with Phalatseâ€™s party, the Democratic Alliance (DA), said it was â€œdeeply disturbedâ€ by the â€œchronically incompetentâ€ Phalatseâ€™s statements and has called for Mashaba to remove her from the mayoral committee. They called her statement â€œjuvenileâ€ and ignorant of the geo-political landscape of the Middle East. â€œThe MMC has essentially in her moment of infantile fascism recognise the vicious state of Israel on our behalf and reduced the entire City to Trumpâ€™s level of political illiteracy,â€ it said. As a member of the DA, people have questioned whether Phalatseâ€™s declaration arenâ€™t just an echo of the partyâ€™s position when it comes to Israel. The DA was criticalÂ of the South African government when it recalled its ambassador to Israel after its military force massacred Palestinian civilians in the Gaza Strip. DA Student Organisation federal leader Yusuf Cassim said on Twitter that Phalasteâ€™s â€œviews do not represent the views of the DA nor that if [sic] the DA led Johannesburg.â€ He said that charges against Phalatse will be laid accordingly. PEOPLE LIVING IN THE PAST HAS NO FUTURE! I am 81 and had a miserable, horrid childhood. But I always said in my mind “NO ONE will keep me down. I WILL SURVIVE!” And I did! Thank GOD for that. Even at my age, I am Stronger mentally than ever. Look forward not back. No one can DO anything about the past. Look to your future and face life. CARPE DIEM – Grab the day! Get up every day and ask yourself: ” What do I have to do today, then DO IT! And tonight when you go to bed, ask yourself: “Did I achieve what I set out to do today?” No? No. I talked too much rubbish with friends. I spent too much time doing NOTHING. WASTING TIME is a sin! You cannot expect achieving anything in life by wasting time and then complain if life is passing you by. TALK LESS AND DO MORE! Procrastination is the evil of today and next to it yakking all day! Shut up and do something.